"I set up a password when backing up my iPhone 5S in iTunes, but I lost it. How can I disable iPhone 5S backup password in iTunes?" When backing up your iPhone 5S in iTunes, you can encrypt for the backup file so that others can't access it without password. This function of iTunes is quite considerate especially when the backup is full of important content. But if you forgot the iTunes backup password, you will not be able to restore from backup. In this article I will intensively introduce the way to get iPhone 5S backup password disabled with iPhone Backup Unlocker. p.s. : This article concentrates on turning off iPhone 5S backup password on Windows computer. As for Mac, refer to another article "unlock iPhone 5S backup password on Mac with ease". Note: if you know your iPhone 5S backup password, you just need to finish steps in part 2 to disable iTunes backup password on iPhone 5S immediately. 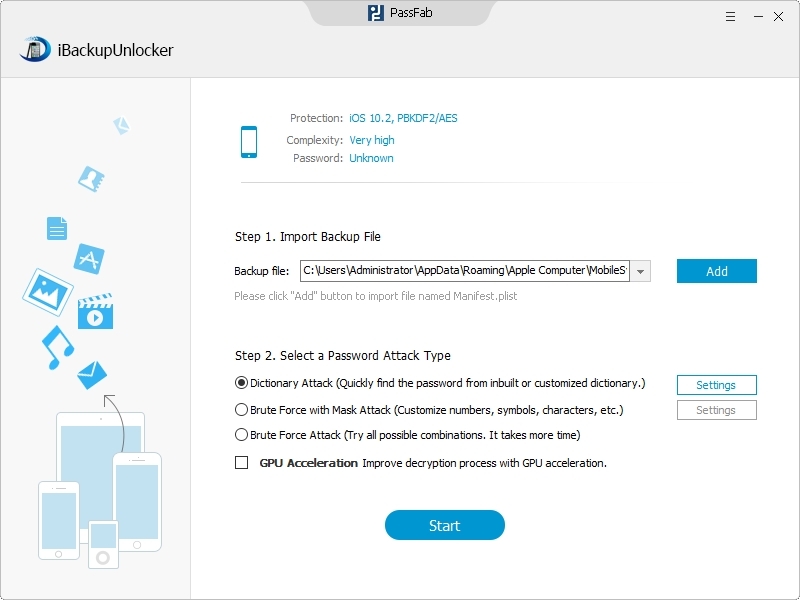 Before moving on, you need to download free iPhone Backup Unlocker and install it on the Windows computer with the locked iPhone 5s backup. Import iPhone 5S backup file. Run iPhone Backup Unlocker, click Add and tap on the locked iPhone 5S backup which you want to unlock. Select an attack type from all choices below and define the settings. 1. Brute-force Attack. If you forgot the password completely, this type of attack will try all possible characters combination randomly. 2. Brute-force with Mask Attack. You can use this attack if you can remember part of your password. 3. Dictionary Attack. This attack is intended to seek that possible password based on a dictionary. This dictionary can be the integrated one or the one you provide. Click Start to disable iPhone 5S backup password in iTunes. During the process, you can stop and save the project to continue it next time. After regaining the password to your iPhone 5S backup, tap on Add and Enter button near to the locked backup. Type the password you got just now and click Decrypt to disable encrypted iTunes backup password on iPhone 5S. Above are all steps of unlocking iPhone 5S backup in iTunes. If you still have any questions about how to use it, click on iPhone Backup Unlocker.